Flickr for Windows Phone was recently updated with some much needed changes. Although there was lots of excitement that the app was added to the Windows Phone Marketplace, the lack of integration seemed to many to be a missed opportunity. The latest update has corrected that oversight. Flickr is now directly integrated with the Windows Phone Pictures Hub. This means that pictures can be updated to the Flickr site without launching the app. In addition, tags are now supported, and there are also general performance improvements. The updated version of the app is available in the marketplace right now. Hmmmm... I don't see the update yet. Picture hub integration is feature I was really waiting for Flickr to have. I'll have to keep checking the Marketplace for the update. The version you should look for is 1.1. 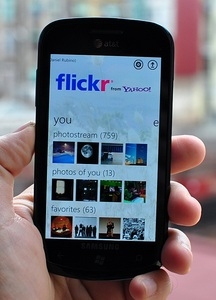 When you are in the Pictures Hub, you can click on an image, then click "share..." and "upload to Flickr from Yahoo!". Hope this helps! Thanks, I got it. Unfortunately, it crashes when I try to upload a photo to Flickr from the pictures hub. That application is one of the buggiest WP7 apps I've seen, even worse than Foursquare.